I don't have time to work this up the way I'd like - you note that nothing is worse on the writing than a full-time job, huh? - but I just had to change the photo without further delay. 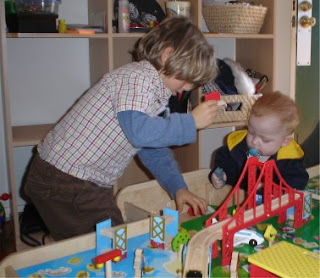 This picture shows our new friend Cornell, age 4, showing Thomas how to play with his new train set. Cornell's family heard what had happened to Thomas this year, and they suspected we were not going to have many gifts to go around this year. Cornell's family doesn't have a lot to go around either, but Cornell said that he thought Baby Thomas would like his old train set. And his parents helped him carefully pick out his favorite books from when he "was a little boy," to bring Thomas, too. So Cornell and his sweet parents brought over this awesome little train table and train set with real moving Thomas-the-Tank-Engine a few days before Christmas. Cornell's dad works for a health food company, too, and the food they brought has given us and several of our friends some really nice dinners, desserts, and snacks. We got a lot of good gifts this holiday season, the kind of gifts that put us closer to being ourselves - I got a coat because I needed one, but the one I received is also the prettiest coat EVER. Our neighbors gave us money to use for a date on our anniversary, and then my mom spent the night so we could actually go out. Donations from friends and strangers helped us pay the bills this month, and also not to worry about all the extras that come up over the holidays. It is an unbelievably weird feeling to receive charity. It is deeply humbling. But charity, after all, is an old fashioned word for love, and that is easy to remember when gifts come with such thoughtfulness and gentleness. We still feel a bit like we're descending from outer space sometimes; we edge in and out of Hospital Time and Trach-with-Cold-and-Cough sleep schedules and MRI days and various aspects of Cancer World, but it seems, still, that we are in good hands. 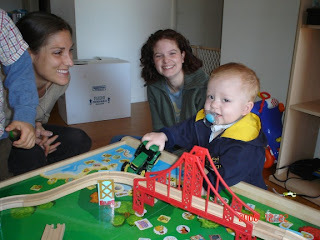 Now he has a train set just like is cousin, Duncan. Love you guys. God Bless Cornell and God Bless Thomas.What a wondeful story. I am Cindy who works with Ronee. I've read your blog since the beginning and have had you all in my prayers and on our Sunday School prayer chain. Our prayer is that 2007 will be another blessed year!!!! !